4-6 pieces of salmon fillet, about 6 oz. each. Heat the oven to 350 degrees. Place the salmon fillets on a parchment lined baking sheet so that they aren’t touching. Drizzle them with the olive oil, sprinkle with salt and pepper, and the dill. Bake for 10 minutes per inch of thickness. If they are an inch thick, then ten minutes should be perfect. Thinner than an inch, bake them for less than ten. Meanwhile make the Hollandaise. In a blender or smoothie maker (a smoothie sized cup is perfect for this if you have one, I use a Ninja) add the egg yolks, lemon juice, a pinch of salt and pepper, and two or three basil leaves. Beat for about 5 seconds. Make sure your melted butter is hot out of the pan or microwave. Very quickly dump in the hot butter and immediately turn on the blender. Beat until the mixture thickens, about 30-40 seconds. This method worked well for me. If you are using a regular blender, drizzle the butter in through the feeder tube while the blender is running. Again, continue to blend until the mixture thickens. If you blend too long it will become a thick mayonnaise. Since this recipe uses raw egg yolks, use your judgement about food safety. You can use pasturized eggs if you wish. Pour the sauce into a small saucepan and stir in the crab, reserving a few pieces for garnish. Heat over very low, gentle heat, just to warm the crab through. The sauce will curdle if it gets too hot. If this happens, don’t panic. You can fix it with a few drops of water and a whisk. To plate the dish, place a piece of cooked salmon on a plate. Top with a spoonful of the sauce. Place a few pieces of crab on and sprinkle a little chopped, fresh basil on top. Serve right away. Tip: If you would like to make the sauce ahead, you can keep it warm in a Thermos for up to two hours! I am a mother of two boys, a wife, a teacher, and an avid home cook. These recipes are written, tested and created or adapted by me in my home kitchen. All photos were taken by me with my Canon Digital Rebel XT. No filters or Photoshop, usually natural light on my kitchen table. My motto is, if I can do it, you can do it! 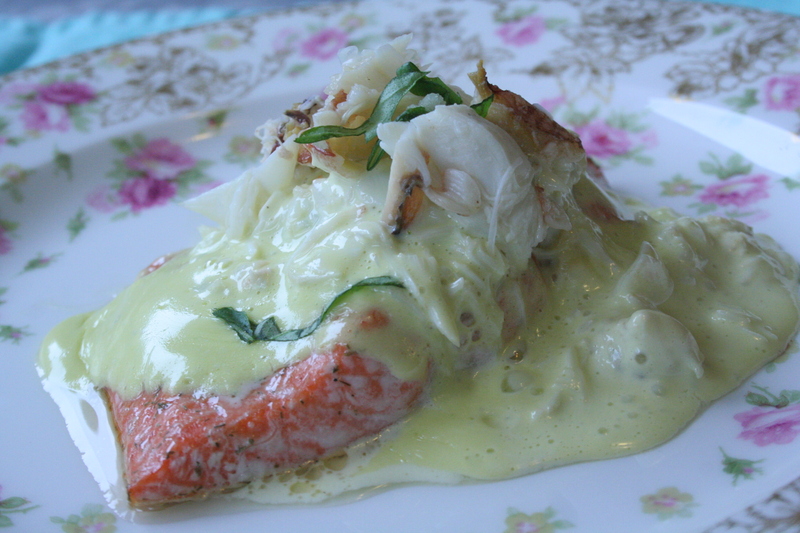 This entry was posted in Gluten Free, Quick Dinners, Seafood and tagged blender hollandaise, crab, crab sauce, easy, fresh, gluten free, Hollandaise, Ninja blender, portland fish market, salmon, Seafood, simple. Bookmark the permalink.